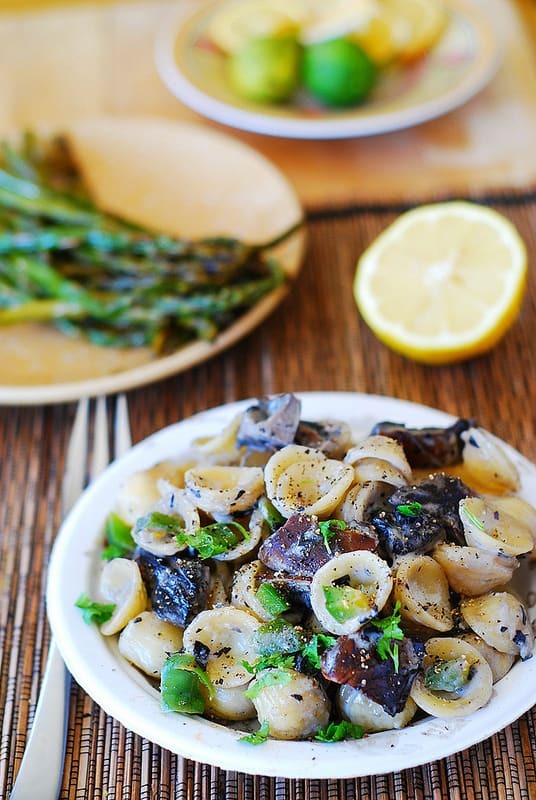 Orecchiette Pasta with Portobello Mushrooms and Green Bell Peppers – delicious, easy, meatless pasta dinner! I love to make quick pasta packed with veggies and coated with lightened up creamy cheese sauce. I often use spinach and mushroom combination for veggies, and this time I wanted to try a different green vegetable that tends to undeservingly get little attention from me: green bell peppers. I’ve also decided to use large portobello mushrooms which, as you know, are often used as “meat” in veggie burgers. So I made this Orecchiette Pasta with Portobello Mushrooms and Green Bell Peppers! I hoped for portobello mushrooms to add richness and “meatiness” to the meal without actual meat, and I was not wrong: this recipe turned out everything I wanted it to be. Please meet my new favorite pasta dish (with not so original ingredients): pasta with portobello mushrooms and green bell peppers! 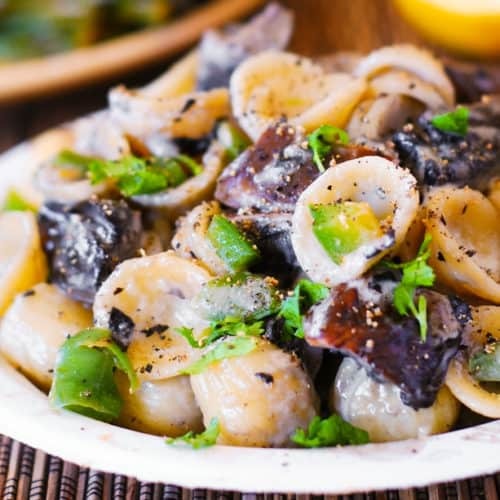 As you see on the photos, I’ve used small pasta shells here, called Orecchiette Rigate. Interestingly, “Orecchio” means “ear” and “Etto” means “small” in Italian, so translated this pasta is actually called “small ears”, as the shape of these pasta shells can remind you of the shape of small ears. Not to freak you out. Any small pasta shells will work here, but I just love orecchiette! This type of pasta is often used with vegetable sauces, and it worked perfectly here, with creamy cheese sauce coating every single little shell (ear)! Portobellos impart a deep, meaty taste to pasta, releasing juices that make creamy Parmesan sauce more satisfying and deeper in color. Bell peppers add freshness and a bit of crunch. 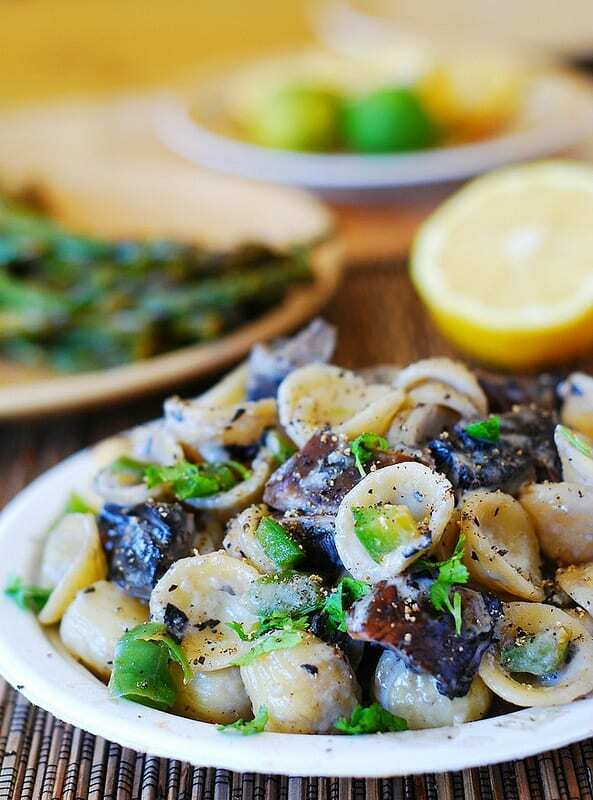 Because of the “meatiness” of portobellos, this quick orecchiette pasta recipe with portobello mushrooms and green bell peppers will appeal to both vegetarians and meat-lovers alike! 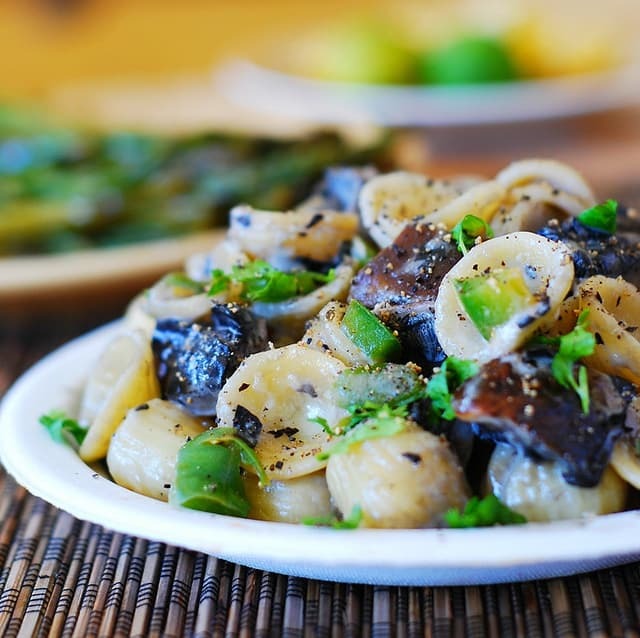 Orecchiette Pasta with Portobello Mushrooms and Green Bell Peppers. Portobello mushrooms add richness and “meatiness” to this creamy meatless recipe. Heat 2 tablespoosn olive oil in a large skillet, add sliced mushrooms and green bell pepper. Add just a pinch of salt. Cook on high heat for about 5 minutes, stirring. Reduce heat to medium-low and continue cooking mushrooms and bell pepper, covered for about 15 minutes, occasionally stirring. Add heavy cream, milk, Parmesan cheese and 1/4 teaspoon salt to the mushroom-bell-peper mixture on medium-low heat and mix. Add pasta to the creamy sauce, stir to coat on low heat for about 5-10 minutes until Parmesan cheese melts and starts to coat pasta as well. Season with salt and pepper, to taste. Serve on warm plates (warmed in the oven). Garnish with chopped cilantro, if desired. I made this tonight and it was delicious! Thanks for a wonderful recipe. Quick pasta for dinner is the best-love portobello mushrooms! Your pasta looks wonderful. No wonder you liked it so much! You’re funny about 8 oz of pasta. 🙂 I do probably need to double my ingredients to correct that: 8 0z does not make enough portions for a family. Very glad that you stopped by and let me know how it turned out. I love pasta dishes like this. Thanks so much for sharing your gorgeous photos and scrumptious recipe. I need to give it a go sometime soon.